There’s just something wrong with the idea of it being 97 degrees outside in the middle of October! How the temperature can go from the 60s to the 90s in one day blows my mind, but then again we live in Texas!! You’d never know it, but Halloween is almost here, which means Thanksgiving is just around the corner. October is a big month for our family as Harper is about to turn one year old!! It’s crazy how fast the time goes. 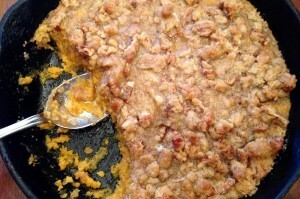 I saw this recipe a few weeks ago from Pinch of Yum for a super easy sweet potato casserole and thought I’d give it a try before the big turkey day. Turns out, it was super easy just as described, and Matt and I both enjoyed it. The pecan crumble topping is buttery, sweet and crumbly, and is a perfect addition to the sweet potatoes baked underneath. 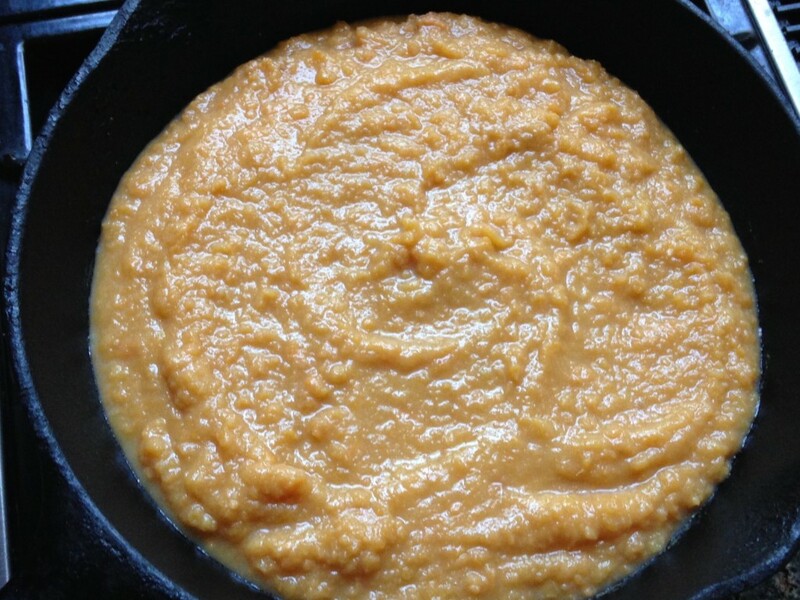 Combine mashed sweet potatoes, milk, butter, sugar, vanilla, eggs and salt, and pour into a cast iron skillet. Combine butter, brown sugar, flour, and pecan pieces to form a crumble. 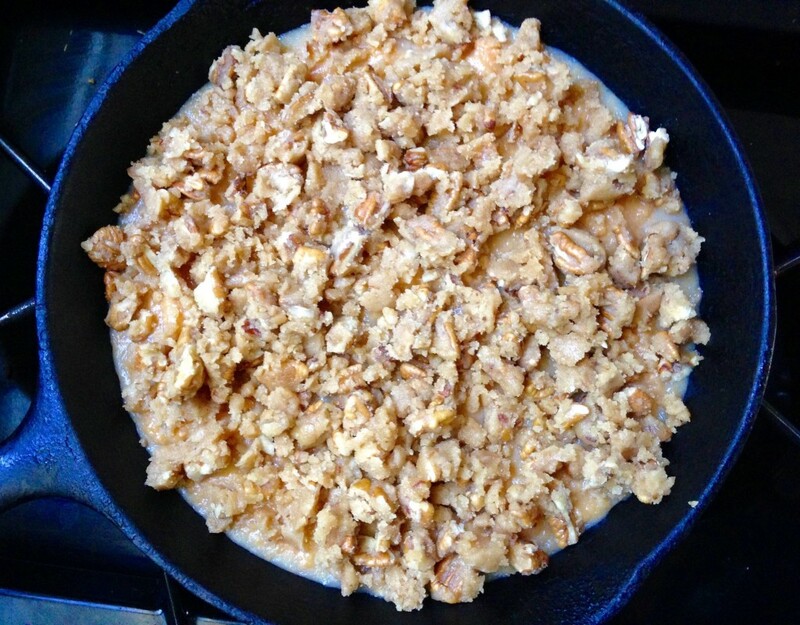 Sprinkle pecan crumble over sweet potato mixture. Easy recipes are everyones favorite. Whether you’re working, taking care of kids, or just don’t want to be in the kitchen all day, this recipe is for you. I prepped this casserole during Harper’s nap time, then took her to the park where she played until 5 pm, and then had dinner (including this sweet potato casserole) served promptly at 6 pm. 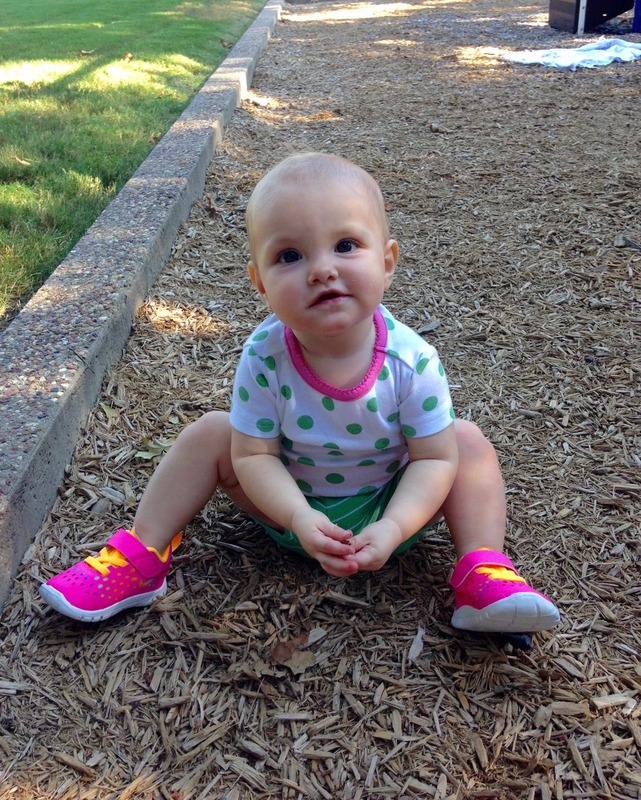 Harper’s first trip to the playground. The wood chips were the best part! Preheat oven to 350 degrees F. Mash the sweet potatoes and add the melted butter, milk, sugar, vanilla, beaten eggs, and pinch of salt. Stir until incorporated. 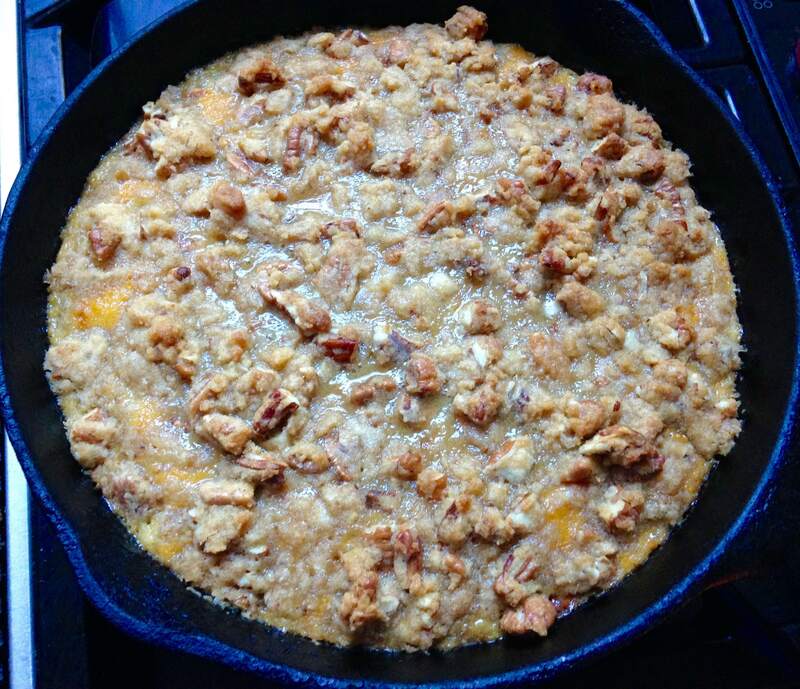 Pour into a shallow baking dish or cast iron skillet. 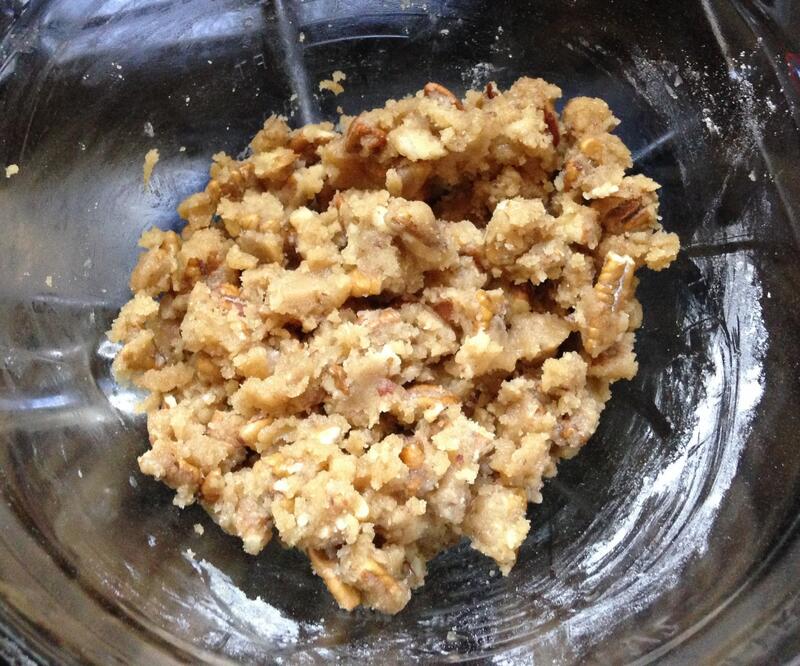 Combine the butter, brown sugar, flour, and pecan pieces in a small bowl, using your fingers to create moist crumbs. Sprinkle generously over the casserole. Bake for 25-35 minutes, or until the edges pull away from the sides of the pan and the top is golden brown. Let stand and allow the mixture to cool and solidify a bit before serving.